Whether you're looking to plan a memorable Outer Banks vacation for your family or a solo OBX adventure, Resort Realty has you covered. 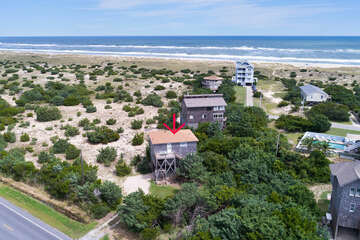 With more than 625 vacation rentals located in Corolla, Duck, Southern Shores, Kitty Hawk, Kill Devil Hills, Nags Head, and on Hatteras Island, you’re bound to find your perfect place. From oceanfront to soundfront and everything in between, Resort offers 1-bedroom condos with community pools to 12-bedroom luxury homes with private pools and hot tubs. Search our site and you will find vacation rentals of every size for every budget. For more than 32 years, Resort Realty has been a leader in Outer Banks vacation rentals, property management, and real estate services. With five convenient office locations from Corolla to Hatteras Island, Resort has a team of dedicated professionals uniquely qualified to help you find the perfect Outer Banks vacation home for you and your family and friends. Book online, over the phone, or inquire about any of Resort’s properties via live chat. Relax on the beach and frolic in the waves with your family. See the wild horses and discover the legendary lighthouses. Tap into your adventurous side and go offshore fishing, jet ski, or kayak on the sound. Experience the fresh, local, and fabulous seafood restaurants and immerse yourself in the amazing history of these unique barrier islands. The charismatic beauty of the Outer Banks has been capturing hearts for generations - let it capture yours. 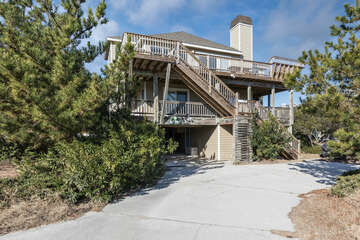 White Sands is located in Southern Shores, NC and is a Semi Oceanfront Property. This Property has four bedrooms and two bathrooms and plenty of outdoor living, including a playground, hammock swing, deck, Private Pool). Guests staying in Our Sea Spray also get complimentary access to the 25-meter Olympic size pool and tennis courts located at the nearby Kinnakeet Shores subdivision. Place yourself in the middle of paradise at Van Dyck in Avon. This cottage’s laid-back vibe is just what you need to relax and enjoy a simpler way of life. Endless beach trips are in your future with the Atlantic Ocean just a short walk away. This traditional cottage is just right for smaller groups. Inside you’ll find 3 bedrooms, 1 full bath, a half bath, a living area, kitchen and dining area. This quaint cottage can comfortably sleep 7 with 2 double bedrooms and 1 kid’s room with a bunk bed and single bed. When you’re not at the beach, relax, read, or entertain out on the screened porch as the gentle ocean breeze passes by. Fire up the park style grill for the ultimate summertime cook-out, or fry up todays fresh catch. There is also a sun deck for sunbathing and an outdoor shower, so you can rinse off sandy feet after a fun-filled day at the beach. A week in paradise is within your reach at the affordable Van Dyck cottage. Book your Avon getaway today! A week in paradise is within your reach at the affordable Van Dyck cottage. Book your Avon getaway today! Guest staying at Van Dyck also receive complimentary access to the 25-meter Olympic size pool, kiddie pool and tennis courts located at the nearby Kinnakeet Shores subdivision behind the Food Lion shopping center. Pets are also welcome, so dont forget to bring them along to enjoy in all the fun in the sun too. 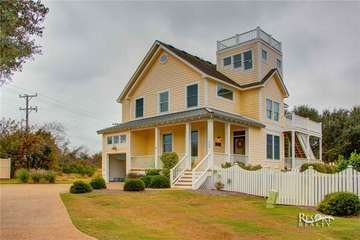 Skipper's Sunlight is located in Duck, NC and is an Oceanside property. This property has eight bedrooms and eight bathrooms, a private pool and hot tub, a recreation room, and access to a community pool, basketball court and beach access. 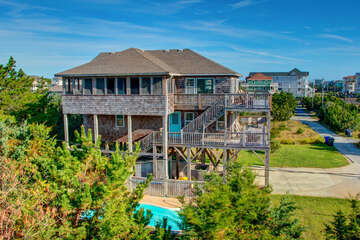 Located on the Oceanside in Corolla, Pair-A-Dice is an 8 Bedroom, 7 Bathroom, 2 Half Bathroom Home located just a Short Distance from Historical Attractions, Local Shopping, and Great Dining. Pair-A-Dice features a 13'x24' Private Pool, Hot Tub, Theater Room, Rec Room, and Volleyball Court.